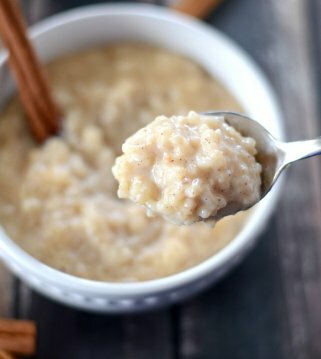 Today I want to share with you a quick and easy recipe that everyone will LOVE! 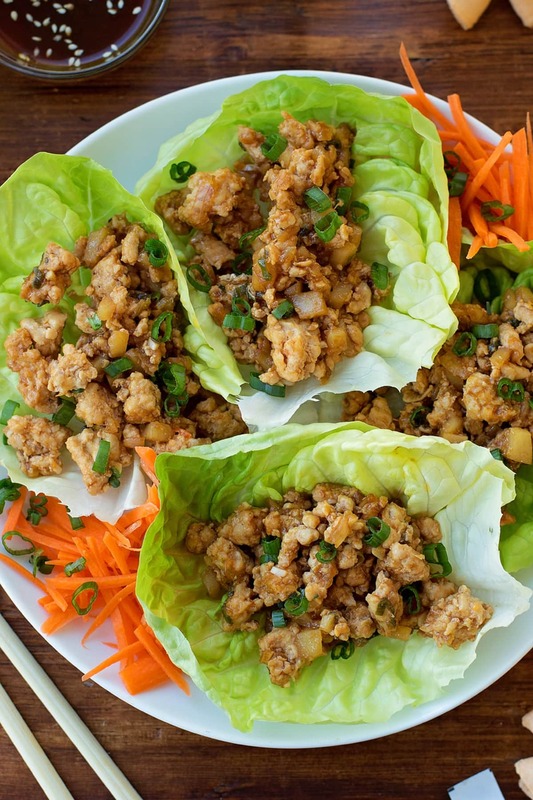 These chicken lettuce wraps are a copycat version of a restaurant favorite (P.F. Chang’s). If you’ve ever been to P.F. Chang’s, you know that these lettuce wraps are light, yet surprisingly filling. 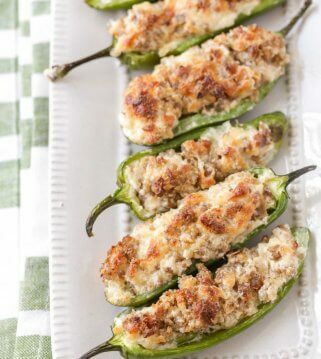 They make great little appetizers, or a flavorful meal on their own. The best part is that they come together in just 20 minutes! 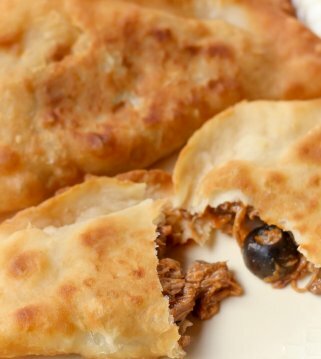 You definitely cannot go wrong with a simple and tasty recipe like this one. The chicken filling is soooo flavorful and savory! With three different sauces and a few seasonings in the mix, you know it’s bound to be delicious! 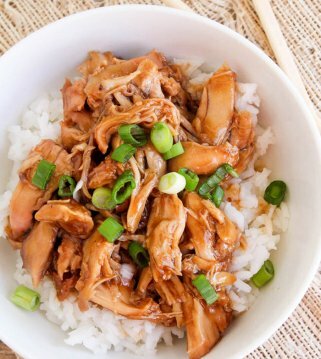 You could easily eat this chicken filling over rice if you wanted to, but wrapping it in a piece of cold crispy lettuce is what makes it so light and refreshing! You just have to try it for yourself to see what I mean! But I’m warning you now – once you try these, you’ll be hooked and there’s no going back!! 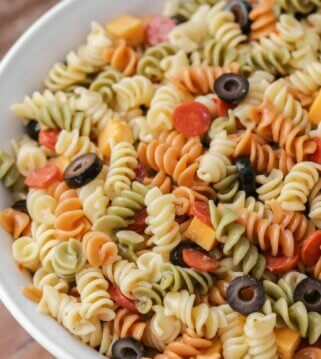 The ingredients list might look a little bit long and intimidating, but I assure you, a majority of the ingredients are simple sauces and seasonings! The steps are even more simple, and as I mentioned before, takes a grand total of 20 minutes from start to finish. Heat the olive oil in a skillet and cook the onion. Add the mushrooms and cook for another 3 minutes, then the garlic and cook until fragrant. 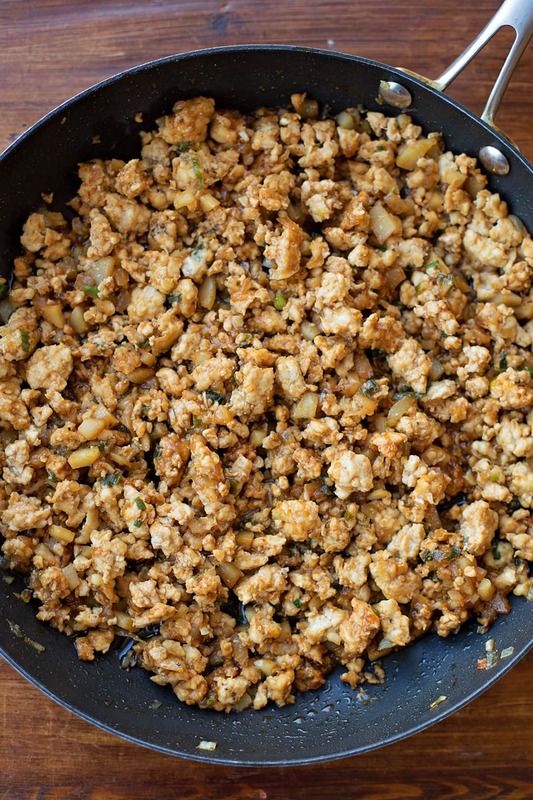 Add ground chicken and cook until browned, then drain any excess fat. Season with the pepper, ginger, and all the sauces. Stir until combined, then add the chestnuts and green onions, cooking for another 3-4 minutes. Remove from the heat. Spoon 3-4 tablespoons of the mixture into the center of a lettuce leaf. Roll into a little wrap, and ENJOY! If you like, you can serve with shredded carrots, crispy rice noodles, or chopped toasted nuts. Everyone who tries these tasty wraps gets hooked, and I think you will too! 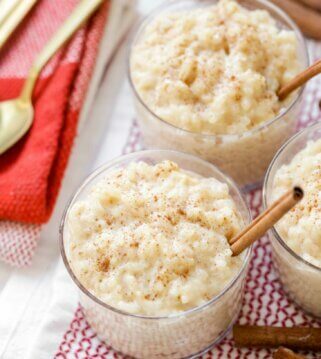 They are perfect for Chinese New Year, or even as a side to one of your favorite Asian dishes. 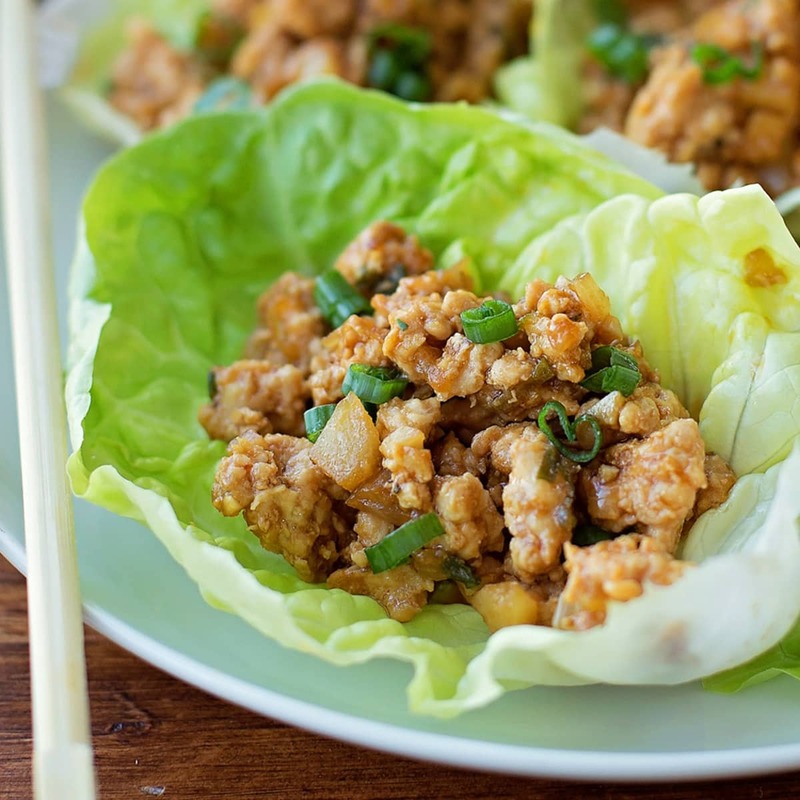 This PF Chang's Lettuce Wraps recipe is a copycat of a restaurant favorite. 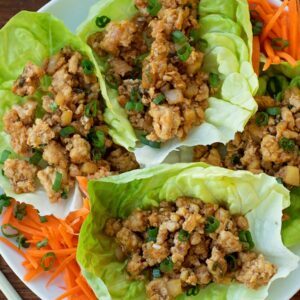 A mixture of ground chicken, minced mushrooms, and onions, seasoned and cooked in oriental sauces and wrapped in fresh lettuce. The chicken lettuce wraps are light, yet filling! Best of all, they take just 20 minutes to make!! In a large skillet set over medium heat, add olive oil. When the oil is hot, add onion and cook for 3 minutes, then add mushrooms and continue cooking for 3 more minutes. Add garlic and cook just until fragrant. Add ground chicken and cook until browned, using a wooden spoon or thick spatula, crumble the chicken as it cooks; drain any excess fat. Season with pepper, hoisin, soy sauce, oyster sauce, sesame oil, ginger and Sriracha/sambal oelek. Stir until combined, then add the chestnuts and green onions. Cook for 3-4 minutes then remove from the heat. Spoon 3-4 tablespoons of the mixture into the center of a lettuce leaf, serve with carrots, crispy rice noodles or chopped toasted nuts. 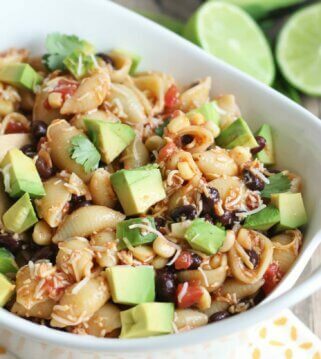 Go visit Natalie over at Life Made Simple for more amazingly delicious recipes! They are!! And, yes they’re perfect for all those New Year’s resolutions to eat better 🙂 Enjoy!! Hi there. Do you happen to have a vegetarian alternative to this recipe? You can make this with tofu. If you freeze the tofu, you can crumble it up after it defrosts. You can then follow the recipe as written. Tried this recipe tonight. Loved it and so did my husband. 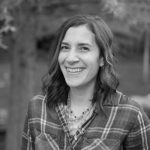 Great work Kristyn! Awe, thanks!! They are a great, healthy option! Is this recipe able to be doubled? If I were to leave out the oyster sauce and the hoisin sauce would it make a huge difference? I’m trying to make this gluten-free for a baby shower. I’m happy to buy gluten free soy sauce but I don’t want to buy gluten-free of all the sauces. I haven’t tried, so really I am not sure how it would change the taste. I am sorry, I wish I knew. I do know they are pretty powerful tastes, so it might a little. Yes, those ingredients are primary to the flavor. 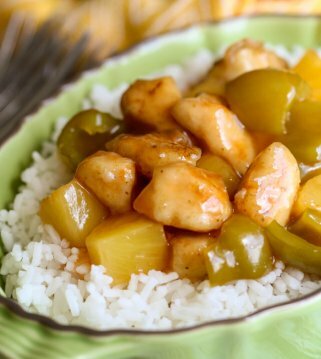 Hoisin and oyster sauces typically are gluten free. Just look to see if there are wheat products in the ingredients list. 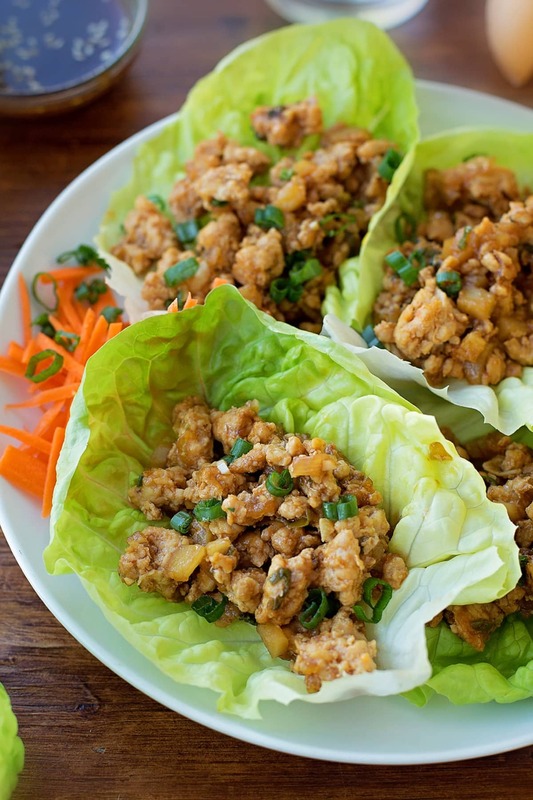 I absolutely love these lettuce wraps! 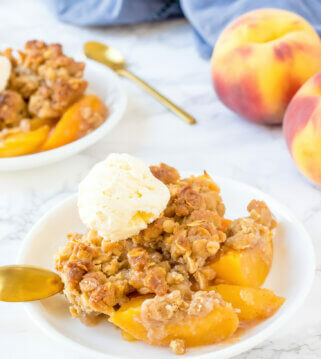 They are a perfect summer dish and quick and easy to make when our schedules get busy. Thank you so much for sharing this. I agree!! Glad to share! Thank you for stopping by! 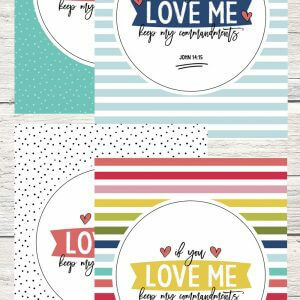 I am so glad you liked them! Thank you! these lettuce wraps are super easy to make! 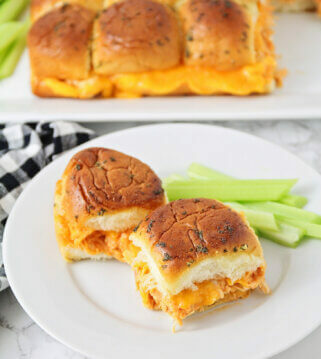 they are full of flavor and definitely a family fav! these are my favorite at pf changes! I am so excited to make them from home. They tasted just like the ones from there. they were so tasty & super simple to make. Thank you! I’m looking forward to making this recipe for a healthy Thanksgiving AppetIzeR but i may need to make it ahead if time. Do you know how well it reHeats? If i heat over the stove until warm, do you think it will be dry? I think it would be ok. You could always add a tiny amount of olive oil when you reheat it. Good luck!! My personal choice is ground pork. It have loads more flavor than chicken. I just made this with a few tweaks. I didn’t use mushrooms but added celery and a little thinly sliced red and orange pepper. Everything else and it was amazing!